That is very cool looking, Patty. I like the hinges on the outside! Love the quilt for seniors! How special. And Patty, awesome closet! I was at the flea market a few weeks ago. Found an old tin breadbox. Love them so. I didn't need another one for bread, and it didn't match my kitchen, but they are a good size. Using it for storage for - don't laugh - my chihuahua's clothes. It's in my girly sitting room. What do you think? Nicole, Luv the bread box... they make great storage bins for sewing/craft rooms too! Nicole great find. The paint is so bright & pretty. I have two bread boxes. One holds ice cube trays for freezing a little of this & that. The other backup paper goods like wax paper, parchment paper, etc.. I did not realize bread boxes were so big. They are very cool and would make fantastic storage containers for many things. Next time I am out puttering around in antique and vintage stores, I will keep my eye open. Just finished making my bed and thought I would share how I repurpose seasonal table runners. Three years ago when I moved into my smaller home with an eat in kitchen - no dinning room. I no longer can leave my gate legged table up - it can sit 8 that way. I leave the sides down and sit 2 unless family comes for lunch and with some maneuvering I can raise the sides. I have several really nice table runners that I no longer use on the table so I now put them across the foot of my bed like you would lay out a throw. The pumpkins with sunflowers tapestry one is on now. Come Dec I will put on the red one with golden reindeers. I have a matching throw pillow for that one. "Autumn~The year's last, loveliest smile." "Country Girl at Heart...Blessed Beyond Measure"!!! That sounds like a wonderful idea. I think I will start looking for seasonal table runners at the thrift stores! I love that idea! I have a red shawl my grandmother crocheted years ago. I use it at Christmas time, draped across my buffet. I love the idea of draping the linens across the bed! It's getting to be that time of year again...chilly days where we want to warm up with a fire in the wood stove. We've bought fire starters of all kinds before, but we found the homemade ones work best and save so much money! I created a little "kit" I keep when we run low, so it is easy to make them from dryer lint, bottoms of old candles, and toilet paper cardboard rolls. The only difficulty and mess I encountered ever was getting the wax to melt safely. When I got my first crock pot years and years ago, it came with a "free bonus" - a "Little Dipper". It's like a miniature crock pot. I never used it, partly because I don't really make hot dips that would require constant heat, and never could figure out how one would dip their chips in it without burning their hands. It sat in my upper cabinet brand new, unused. I used it the other day to melt the old wax. Perfection! It works perfectly for this use, making the task of making home made fire starters a snap. It melts the wax at a low temp without scorching or at dangerous heat. Of course, using it for this purpose makes it unusable for food again, but that's okay. It's getting used now! Nicole, great idea for fire starters. Another use for your little crock pot is to either melt wax or use cheap cooking oil, add essential oil and it's better than Glade. I have also have filled it with water and steeped cinnamon sticks, cloves, apple peelings & cores, orange rinds, pumpkin spice, etc. - fills the kitchen with good smells all day. Nicole, I do the same thing with a big crock pot that I picked up from a thrift shop. I also melt all my candles in a warmer so when they lose their scent I make fire starters out of them before putting in a fresh candle. Because I make fire starters friends and family keep me supplied with old candles. Great tips, Sara and Patty! Thanks! I was blessed to have Patty as my Fall Swap partner and she sent me some of her homemade fire starters and they work wonderfully! She also told me how she makes them so when I run out, I will be able to make more! Thanks again Patty! Hey Nicole! If you ever get lazy, like I do, and don't want to mess with melted wax, this is how I make mine. I just chunk out the wax from the candle with a butter knife; it usually breaks into a few pieces, although some of the wax is a bit more greasy. I then take a chunk of wax, some lint, and fold into a parcel of newspaper, like half a sheet. I tie with a small piece of twine like wrapping a present. Works great, and you don't have to melt the wax. When you're married to a builder/welder/machinist/woodworker/inventor, etc., etc. all kinds of things collect in your yard. I was finally able to talk my hubby into looking at loading up some of the stuff (scrap metal items) from our yard and taking to our local salvage yard. Our local salvage yard is a pretty impressive business. Every time I go there I'm amazed at what is there and how they handle it. My latest passion is to make a rounded yoke denim blouse. Can't find one. Can't find patterns today that feature one. So..... I found a pattern out of print, needs to be remade to my size. I have lots of old denim sitting around. I saw a lady pictured in an Italian store wearing the coolest blouse. Can't get it out of my mind!!!!! Have an old pattern fitting book. Wish me luck! Sassy City Girl with Farmgirl Fantasies! Sylvia, I would love to see one finished! Please, please post pictures! I took a denim jumper and created a apron out of it. I just cut up the side, leaving enough to turn a hem, left the straps at the top to make the strap around the neck, and using part of the back to make the ties. It is going to be very handy when I craft. I love how it turned out. The whole thing cost me a quarter, my thread, and my time. Gotta love our thrift store twenty five cent Wednesdays. Too good to be true, but the truth. I also bought the metal round decorative casserole holders like my grnadma used. They were shiny silver and held a glass casserole dish. I sprayed mine oil rubbed bronze and it turned out amazing, I am going to use it at Thanksgiving and serve corn bread casserole. I also found a aqua crock type bowl that fits in one of the casserole holders. I love it. I also have a tarnished large metal silver tray I am going to spray. Such a cheap easy fix, and looks so good. 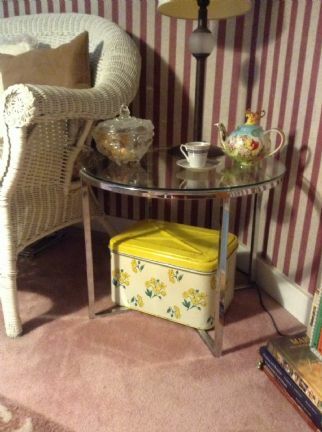 On Pinterest I saw this end table that was the black wrought iron stand of a treadle sewing machine and a furnace floor grate at the top. I dug around in one of our sheds and found a beat up treadle and took the wooden case off which was shot. I then started looking for something to use that looked like a floot grate. As I walked up our sidewalk, there it was. I have a scrolly iron door mat that I washed up and it was a perfect marriage. After a bit more cleaning it is now in my living room beside my couch. I love it., As soon as I get my laptop fixed I will post a picture. I love it when something turns out the way a person thinks it should. This was almost perfect. I cut them up into squares, and stitch them together willy nilly... and Voila! a snuggly warm neck scarf.